I do not often read books that fall into the Middle Grade category, but this one intrigued me--and it came recommended by my friend and fellow blogger, Caspette of Narrative Causality. It was the setting (Japan) and the mention of Japanese mythology that convinced me to give it a try. Saki is not happy about having to leave Tokyo and her friends to spend her break with her paternal grandmother. There is nothing exciting or worthwhile about spending time in a small village, preparing for an outdated ceremony like Obons, or so she believes. While in an effort to impress the village in-crowd, Saki bends to peer pressure and comes away from the experience embarrassed and bearing a death curse. She has three nights to lift it. Three nights, three spirit guides, and the Night Parade of spirits traveling to the ancestral burial site is nothing Saki has ever experienced before. Saki is about twelve or thirteen years old, I think, and on the verge of becoming a teenager and yet still with the innocence of childhood. Like many young and old, Saki is struggling to figure out who she wants to be, having to deal with peer pressure, family obligations, and being true to herself. She is also seeking to find balance between the old and the new: tradition/spiritual and modern times. Each of the obstacles Saki encounters along her path to life, including the curse, help her learn more about herself and choose the direction she wants her life to go. The mythical beings and spirits are part of what make this novel such a great book, in my mind. I do not know much about Japanese mythology, but this book made me curious enough to do some research. I quite enjoyed getting a glimpse into this part of Japanese culture, finding it both fascinating and humbling. As you can tell, I was quite taken with The Night Parade. I even read parts to my daughter, when she was willing to listen. I can see her reading it when she's older--and me again too. To learn more about Kathryn Tanquary and her work, please visit the author's website. She can also be found on Goodreads and Twitter. This sounds very intriguing! And the mythical part is another factor which draws me to the book. I'll have to check this out. Melody - It was so good! I hope you do give it a try, Melody. :) I do read MG books, and this one sounds like a winner. My excuse is that I look for books for grandkids, but the truth is that a good book is a good book! Thanks for the rec! Jenclair - I'll be curious to know what you think of this one if you do read it. I agree, a good book is a good book no matter the age group it may be marketed to. I am glad I took a chance on this one. It didn't even cross my mind when I requested to review it that it was a middle grade book. I just thought it sounded good. This sounds wonderful! I really neglected middle grade last year and one of my goals this year is to fix that. This sounds like just the kind of book I'm looking for! I love the mystical beings and Japanese mythology is something I know very little about. Great review! I'm looking forward to reading this one! Katherine - There was so much I enjoyed about this one. It really was a delight to read. I hope you will get a chance to read it! Since you mentioned spirit world, I'm not sure this is for me. Kathy - I wish I could tell you the fantasy/spiritual elements were subtle, but they really made the book for me. I know this one wouldn't be for everyone. The book sounds fantastic! I love Japanese mythology, so this is right up my alley. Eustacia - I hope you are able to read this one. It was such fun. Sounds great, the use of Japanese mythology in particular. Charlie - I thought so. I found it very interesting and liked the way the author put it all together. Loved the cover. I'm so glad that despite your not normally reading books for this market you found this one so good. I can see the appeal of this one. I generally enjoy middle grade books much more than I do YA books so this one is right up my alley. Athira - I rarely felt like I was reading a middle grade book while reading this one. I think the older crowd would enjoy this one too. 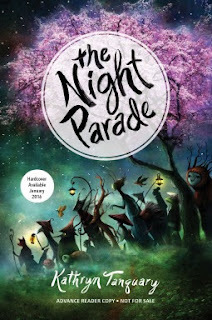 Cute cover on The Night Parade. Glad you enjoyed it, I like quirky characters too. The Japanese mythology sounds interesting as well. Naida - I like the cover too. :-) It was a fun book and so well written. I really enjoyed it. That's such a pretty cover on the book. I don't typically read books for middle grade but this one does make me curious that I might be missing out! Iliana - This one, I think, is worth reading Iliana. It didn't feel like a middle grade novel. This sounds like a really great read- I should have my son check it out! Thanks for sharing! Samantha - It was so good, Sam! I can't recommend this one enough. I love well-written MG books, and I would love to read this one. I even requested it when it showed up on Edelweiss (or was it NetGalley?) Alas, I didn't get it, and neither did my library. But I plan to show them your review and see if they won't order it! Lark - I hope your library will change their mind and get this one. It is definitely worth having on the shelf. So glad you enjoyed this too, I loved it and the setting was just amazing! Heather - Yes, the setting was amazing. And I just loved the spirits. Such a good read. I am glad you liked it too! This book has a great cover and it was available at one point on Netgalley and I never grabbed it. All the reviews including yours makes me regret not getting it. Michelle - Thank you! This one came recommended and so I jumped at the chance to read it while I could. I'm so glad I did.